WOW! What a great winter we have been having here at Holden Beach, NC. Our staff here at Alan Holden Vacations worked very hard this past fall to get out our newest rental brochure for the 2011 vacation rental season. Our brochures were completed, printed and mailed out a few days before Christmas 2010. If you were wanting to get one, and did not get one in the mail, you can download and print it right off our website. 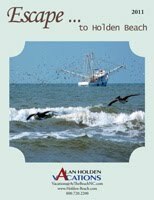 Just go right to our Alan Holden Vacations and click on the brochure in the upper left corner of the page. Here you can browse the brochure, click on a home for more information and it will take it to the house description page right on our website. From there you can book right online!! You folks up north who have been fighting the severe snow storms this winter, you should start thinking about the our 95 degree, sunny weather here on the island. Start thinking about that cold drink in your hand while lounging in your beach chair listening to the seagulls sing their songs. Gently gazing out onto the smooth 84 degree ocean water with knee high waves gently lap onto the shore. Ahhhhhhhh, seems like your paradise is not that far off in the future. To be sure you are able to make it to the beach this summer, now is the perfect time to start making your beach plans with your friends and family. It looks like the number of reservations are picking up in the rental market! Our reservations for the upcoming 2011 rental season are ahead of last years numbers. If you are wanting to wait until the last minute to make a reservation and come to the beach, it is possible you may have a harder time finding a place that will meet your requirements. All the snow storms up north have seemed to have sparked an earlier rush in the beach rentals for this summer. Everyone is wanting to "just get away from it all". The sales market here in the Brunswick County area and Southern Brunswick Islands seems to be picking up as well. More foot traffic has been increasing in our RE/MAX at the Beach offices. Speaking of RE/MAX at the Beach we have opened a new sales office in the southern part of Brunswick county. The new office in now located within the Sea Trail Golf community down near the Sunset Beach, NC and the Ocean Isle Beach area. You can read more about it in the previous post on this blog. The opening of this office assures you as a seller or buyer that we have all of the surrounding areas covered. Due to our remarkable and experienced agents, we will have you in the house of your dreams in no time! That sounds great. It will surely be wonderful to spend a vacation there at Holden Beach. I hope we can go there soon. Our new RE/MAX at the Beach sales office!! Merry Christmas from Holden Beach, NC!